Ardbeg Alligator (51.2%): Actually I tasted Alligator for the third time last Sunday at a tasting hosted by Dr. Bill Lumsden and David Blackmore in NYC. For some reason it took me some time to build a relationship with it since I first tasted it but finally I feel like writing about it. 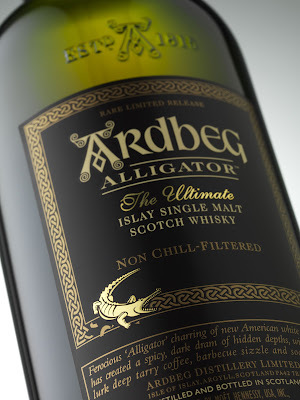 Alligator is one of Dr. Bill Lumsden's limited releases we got used to expect from Ardbeg almost every year. Standard 10 years old Ardbeg aged in ex-bourbon cask is married with whisky aged in heaviest possible charred barrels called Alligator barrels and matured further for a final treatment after the vatting. Color: Very light straw. Nose: This is a creamy Ardbeg dessert. Vanilla beans, key lime pie and lemon custard are the first notes. Sweet spices, powdered ginger and star anise follow. Adding water amplifies sweet barbecue, burnt pork fat and bacon aromas. Palate: Unbelievable how dominant vanilla is on the palate. Vibrant young whisky in the vat shows up which reminded me Ardbeg "Almost There" a little bit; grassy and medicinal. Burnt tarts, quince jam and grapefruit gratin. Finish: Pretty dry, muscular and long. All spice, cloves and cinnamon. Overall: To be honest I wasn't blown away for the first time I tasted like I was with Corrywreckan or Uigeadail a few years ago but it grew on me little by little every time I tasted. I am still struggling to justify it's price tag though... It's a tasty dram, no doubt about it but so damn pricy compared to other Ardbeg expressions. If you are adventurous enough to purchase a bottle I strongly recommend to take your time with it. This dram requires patience and attention. The more time you spend the more layers and complexity you will discover. 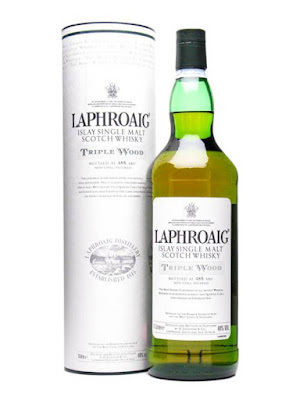 Remember seeing Laphroaig's Triple Wood at the duty free in LHR, but not sure about the Alligator. Can you also tell the prices? And thanks for the suggestions dostum, hoping to catch one of these next time at duty free!